I can't work, I can't think, I can't connect with anyone anymore. . . . I mope through a day's work and haven't had a promotion in years. . . . It's like I'm being sucked dry, eaten away, swallowed up, coming unglued. . . . These are voices of a few of the tens of millions who suffer from chronic insomnia. In this revelatory book, Gayle Greene offers a uniquely comprehensive account of this devastating and little-understood condition. She has traveled the world in a quest for answers, interviewing neurologists, sleep researchers, doctors, psychotherapists, and insomniacs of all sorts. What comes of her extraordinary journey is an up-to-date account of what is known about insomnia, providing the information every insomniac needs to know to make intelligent choices among medications and therapies. 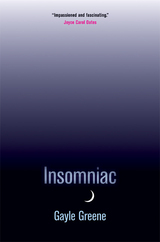 Insomniac is at once a field guide through the hidden terrain inhabited by insomniacs and a book of consolations for anyone who has struggled with this affliction that has long been trivialized and neglected. Gayle Greene is Professor of Literature and Women's Studies at Scripps College, Claremont California. She has published books on Shakespeare, women writers, and scientific issues. Her most recent books are Doris Lessing: The Poetics of Change and The Woman Who Knew Too Much: Alice Stewart and the Secrets of Radiation. She is a member of the American Academy of Sleep Medicine (AASM), a professional medical society for researchers and clinicians, and is the patient representative on the board of the American Insomnia Association, an organization within AASM. "The good news is that Gayle Greene's book is all you ever need to read on the subject of sleeplessness; the bad news for fellow insomniacs is that reading it —even in bed—will fail to lull you to sleep. "—Billy Collins, former Poet Laureate of the U.S.